A collection of Life's moments: Go out of your comfort zone !! If you know me well, then you must be knowing how much i love walking and any form of cardio workouts. I call myself a cardio girl. For some reason, i would feel that when i walk briskly or run, i sweat a lot and only then i think that i have worked out. That is how i slowly managed to lose my weight. Agreed that i lost weight but i did not have any strength nor was i toned. I was on my goal weight but i would have huge thighs and bat wings down from my arm. Initially i ignored them but later as i came to know about strength training workouts and toning routines, i started to move incorporate them into my regular walking/running routine. To start something new, i tried adding Tone It Up routines occasionally. Then they announced start of their TIU Love Your Body Challenge which started on Jan 1 for 6 weeks. What a perfect timing it came at. I started to strictly follow their workout schedule and incorporate strength training and toning routines. Initially it was not at easy for someone like me who did not know to do the movements properly. You would not believe but i could not do a push-up properly. Firstly my upper body strength is weak. Secondly my form also went wrong. Slowly and steadily with practice i am now able to do them on my knees. I am still on my way building strength and waiting for the day when i would do full push-ups. So while doing the TIU workouts, i would pause the video several times to do the move and then complete the workout. It was completely a new experience for me as i would rarely sweat during the toning workouts. But i knew it is working as i would wake up sore the next day. Overall i realized that performing a muscle toning exercise type workout will improve muscular strength, increase lean muscle mass and density and improve muscular endurance. Muscle toning involves regular exercise that targets specific muscles and gives them the workout they need to become lean and healthy. 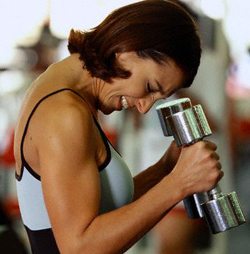 The obvious benefit to toning is achieving a lean, attractive body. So with my goal in mind to tone my body, i have stuck strong with the TIU challenge. In the last 4 weeks that i worked on this challenge, i lost a total 12 inches which is awesome to me. After completing the TIU challenge, i am planning to start the 30 day Yoga challenge which will be another new thing for me. So i plan to continue this journey of incorporating strength training to my routine, i am going out of my comfort zone and do routines which i have never done before. But as the saying goes - When you want something you have never had, you have to do something you have never done !! Linking with Jill and Jessica for the awesome theme !! This is so awesome! I love the TIU team.. glad you found it too. You should definitely share your results with Karena & Katrina... I bet you could get featured (if you wanted to) in one of their Monday Motivation posts. That is a wonderful idea. I would definitely share my results with them once the Love your body challenge is done :) Thanks for stopping by !! WTG with the TIU challenge! Keep it up. I can't wait to hear what you think of yoga after the 30 day challenge. What challenge are you going to do? Thank you so much. I am planning to do the 30 day Yoga With Adriene challenge after the TIU Love your body challenge !! Thank you so much. I just love your awesome linkup and look forward to it each week.